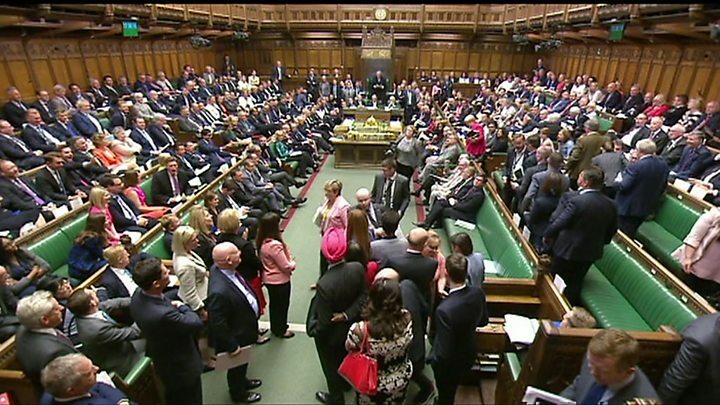 SNP MPs have walked out en masse from Prime Minister’s Questions after their Westminster leader was thrown out of the chamber in a row with the Speaker. Ian Blackford refused to sit down when ordered to by John Bercow having asked for the Commons to sit in private. This was in protest at a lack of debate on what he said was a “power grab” in the EU Withdrawal Bill. It brought PMQs to a temporary halt as the Speaker consulted his officials on what to do next. Mr Bercow said MPs could vote on the request for a private sitting at the end of PMQs – but when Mr Blackford refused to sit back down he was suspended for the rest of the day’s sitting. His fellow SNP MPs followed him out of the chamber. Reality Check: Has the UK’s devolution settlement been ripped up? 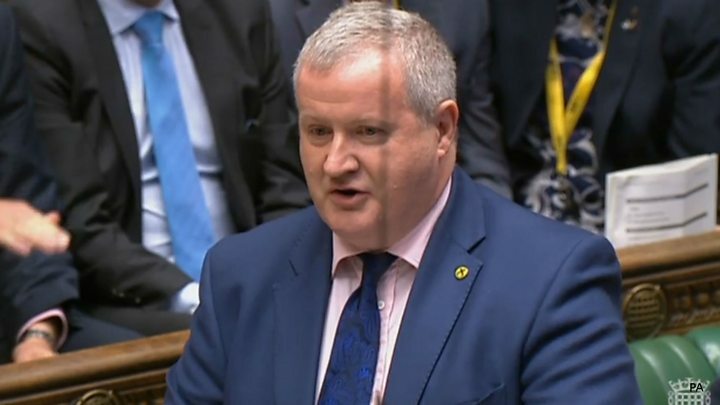 The episode took place during the weekly Prime Minister’s Questions session after Mr Blackford said it was a “democratic outrage” that MPs had not been given enough time to debate measures he described as a “power grab” by Westminster from Scotland. Mr Bercow said it was better for a vote on his request to take place at the end of the session – but the SNP MP did not agree, rejecting repeated orders from the Speaker to resume his seat. Speaking afterwards, Mr Blackford told the BBC’s Daily Politics his party would “use Parliamentary procedures to best effect” to protest against what he said was devolution being “ripped up” as powers are repatriated from Brussels. His suspension from the Commons means he is unable to take part in the second day of debate on the EU Withdrawal Bill. Parliament retains the right to hold debates in private and any MP can propose that members of the public and press be removed from the galleries at any time. If such a proposal is made, the Commons Speaker must put the motion “That this House sit in private” to a vote without debate. But the procedure is seldom successful – attempts to exclude members of the public are usually deployed as a device to disrupt or delay the House’s proceedings. MPs used to call out “I spy strangers” to invoke this procedure, but this phrase was replaced with the current wording in 1998. The EU Withdrawal Bill is a key plank of the government’s Brexit strategy, aiming to ensure a smooth transition on Brexit day when EU law no longer applies in the UK. But the Scottish Parliament has refused to give its consent to the legislation, saying policy in devolved areas that is currently decided in Brussels is being reclaimed by Westminster. The bill is currently making its way through Parliament – and although devolution was to be debated in the second half of Tuesday’s session, there were only a few minutes left for this after voting on amendments went on for almost three hours. The Brexit bill says that the “vast majority” of the 158 areas where policy in devolved areas is currently decided in Brussels will go directly to the Scottish and Welsh parliaments after Brexit. But it has also named 24 areas where it wants to retain power temporarily in the wake of Britain’s exit from the EU, including in areas such as agriculture, fisheries, food labelling and public procurement. It says the “temporary restriction” on the devolved governments using some of the powers returning from the EU is needed “to help ensure an orderly departure from EU law” and allow the same rule and regulations to remain in place across the whole of the UK.